During menopause, short term memory issues - known as memory lapses or brain fogs - can infiltrate every aspect of a woman's life, from her productivity in the workplace to her relationships with loved ones. Frustrating and sometimes distressing, brain fogs can make it difficult to concentrate, adapt to a change in routine, and process, store, and retrieve information. The causes of short term memory loss are varied; while the primary cause is most likely hormonal, other dietary, biological, and environmental factors can trigger or exacerbate the symptom, too. Estrogen is a hormone that affects the cognitive functions via its influence on the vascular and immune systems, controling the activity of the hippocampus and other memory-boosting neurotransmitters in the brain and enabling healthy potention (i.e., the process responsible for the formation of new memories). When a woman is in her forties and early fifties, estrogen production declines as the body prepares for menopause. This causes a hormonal imbalance that can impair short term memory, making concentration, adaptation to changes in routine, and processing, storing, and consciously retrieving information difficult. Fatigue is a term used to describe extreme physical and mental tiredness. This may come about as a result of hormonal changes or various symptoms – such as night sweats – during menopause, though fatigue is also indicative of other conditions, including depression, chronic fatigue syndrome, and infections, such as the flu. Fatigue lowers energy and concentration levels, which can cause problems with processing and absorbing new information, making it difficult to willfully recall it at a later date. Depression can be experienced by men and women at any age, but women are especially prone to it during menopause due to the hormonal, physical, and emotional changes she'll experience in these years. Depression can cause distraction, lack of interest, and difficulty concentrating, which are likely to hinder memory. Hypothyroidism is a condition that's a common side effect of menopausal hormonal changes where the body does not produce enough thyroid hormones, meaning the thyroid is therefore unable to regulate metabolism properly. When the metabolism does not function correctly, the entire body, including the cognitive functions, are affected; memory loss is usually an early symptom of hypothyroidism. Stress may be brought on by a number of physical and environmental factors, but it's particularly common during menopause. In a crisis, cortisol production increases to raise energy and alertness. But when anxiety is chronic or ongoing, the brain is filled with "crisis chemicals" that are intended for emergency use; these can obstruct the process of potention, leading to short term memory issues. At any age, binge drinking can impair parts of the brain that form new memories and cause short term lapses known as blackouts. Long term regular heavy drinking or alcohol dependency can affect short and long term memory loss as a result of malnutrition (i.e., a vitamin B1 deficiency) and lead to memory-impairing diseases, such as hepatic encephalopathy or Wernicke-Korsakoff syndrome. While a certain amount of memory loss is inevitable with aging and the odd moment of forgetfulness is nothing to worry about, menopausal brain fog can be more difficult to deal with, as it is more intense than simple absent-mindedness. 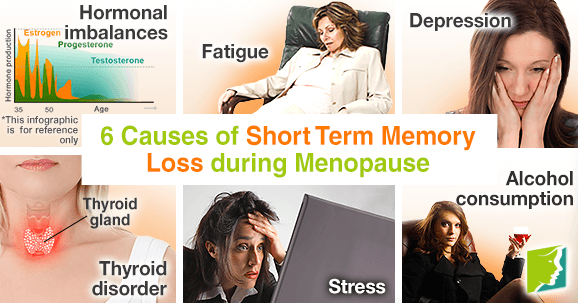 If you identify with the causes of short term memory loss during menopause, it's a good idea to find natural approaches for treating memory lapses. Like other functions in the body, your memory can be strengthened with simple, positive adjustments to your diet and habits.